Point 12 Services is happy to help you with your boating and lake activities. We have designed a unique company that combines our love of "all things water", and our experience and ability to serve our friends and neighbors here on Bull Shoals Lake. We will thoughtfully design custom docks, boat lifts and custom dock accessories to suit your needs. We will tend your docks and email each time the dock is moved, with lake levels and a fishing report. You and your friends may want to enjoy a day on the water with Alfred Denninger, licensed & insured fishing guide in the State of Arkansas. Denninger's also designs and creates some of the finest copper weather vanes in the world. 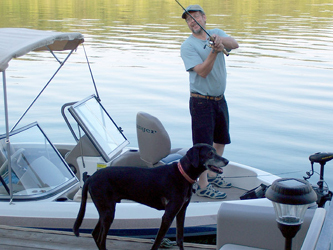 It is our pleasure to make your home-on-the-lake experience enjoyable.